The Schoodic Summer Chorus performs beautiful and unusual music from a multitude of times and places, from Renaissance Europe to twenty-first-century pop and vocal traditions from the Balkans to Africa to Appalachia. 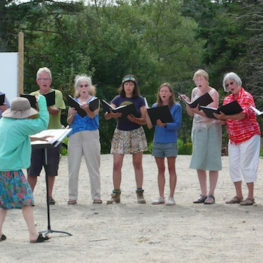 The Schoodic Summer Chorus is a multi-generational a cappella community chorus devoted to nurturing musicianship and community. Our members share a passion for singing beautiful and unusual music. Directed by singer and composer Anna Dembska, the chorus welcomes anyone who loves to sing. Concerts include the opening night of the Schoodic Arts Festival and two or three additional Downeast performances in August.